Looking for a New Toyota Yaris in your area? CarGurus has 1,301 nationwide Toyota Yaris dealers with 22,595 new car listings. After the addition of an active safety technology suite last year, the Toyota Yaris gets an exterior makeover and some interior upgrades for 2018. The subcompact hatchback, available with 3 or 5 doors, is still an entry-level vehicle, but these steady steps forward ensure it’s a competitive one. The reworked front fascia is still dominated by a gaping black air intake that gives the little Yaris a touch of aggression. The changes at the rear are more pronounced, with re-shaped vertical taillights extending into the hatch and a remodeled bumper that houses reflectors in the lower corners. The Yaris powertrain carries over from last year: a 1.5-liter inline 4-cylinder that produces 106 hp and 103 lb-ft of torque. The L and SE trims come standard with a 5-speed manual transmission but can be upgraded to a 4-speed automatic, which is the standard transmission for the LE. Fuel-economy numbers for the 2018 Yaris have not been released, but the 2017 model got 30 mpg city, 36 highway, and 33 combined with the manual transmission and 30, 35, and 32 with the automatic. The Yaris is so lightweight it has no trouble keeping up its speed. The steering is responsive, but there’s noticeable body roll when you push the hatchback through corners. For 2018, the SE trim gets some sporty new performance upgrades—a stiffer suspension, rear disc brakes, and low-profile 16-inch tires. For 2018, all 3 Yaris trim levels—L, LE, and SE—receive some sporty instrumentation that was previously available only on the top-end SE, such as 3 actual gauges (speedometer, fuel, and tachometer) and an LCD display. Standard features for the base L trim include cloth upholstery, Bluetooth connectivity, and the latest Entune infotainment system, which has a 6.1-inch touchscreen display, Siri Eyes Free compatibility, and a quick-charge USB port. Moving up to the LE trim adds cruise control, power mirrors, remote keyless entry, 15-inch aluminum wheels, and upgraded interior trim. 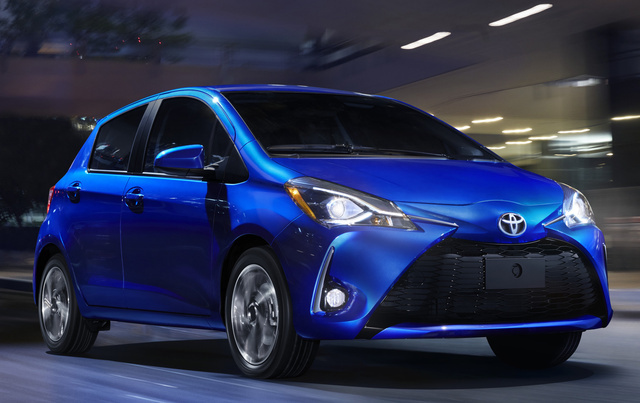 The Yaris SE trim gets the sporty treatment on the exterior with a rear spoiler, LED running lights, fog lights, unique grille treatment, projector-beam headlights, and 16-inch machined aluminum wheels with dark accents. This sporty theme continues to the interior, with a leather-wrapped steering wheel and shift knob, black sports fabric seats, and a manual driver’s seat height adjuster. On the technology front, the SE receives a 7.0-inch touchscreen to control its upgraded Entune Audio Plus infotainment system, which includes satellite radio and navigation. The Yaris offers 15.3 cubic feet of cargo space behind the rear seats in the 3-door model and 15.6 cubic feet in the 5-door model. The rear seats do fold flat to offer more room, but if hauling lots of cargo was a concern, you probably wouldn’t be shopping in the subcompact section. The Safety Sense P suite of features added to the Yaris last year includes a pre-collision system with pedestrian detection, automatic high beams, lane-departure warning, and radar cruise control—an unprecedented level of safety technology for this segment. The Yaris also comes with 9 air bags, including knee air bags, and the 2017 model received a 4-star crash-test rating from the National Highway Traffic Safety Administration (NHTSA). What's your take on the 2018 Toyota Yaris? Users ranked 2018 Toyota Yaris against other cars which they drove/owned. Each ranking was based on 9 categories. Here is the summary of top rankings. Have you driven a 2018 Toyota Yaris? Enter your zip to see incentives for a new Yaris in your area. CarGurus has 7,244 nationwide Yaris listings starting at $1,977.